A child's first birthday often marks the transition from formula to cow's milk and more solid foods. At this point, most babies already have a taste of mashed baby food and possibly table food. Keeping your baby on a balanced diet while continually to offer new foods meets a 1-year-old's nutritional needs while encouraging healthy eating habits. By age 1, your child should begin to move away from using a bottle for drinking if he hasn't been weaned already. Waiting longer to get rid of the bottle may make the process more difficult. 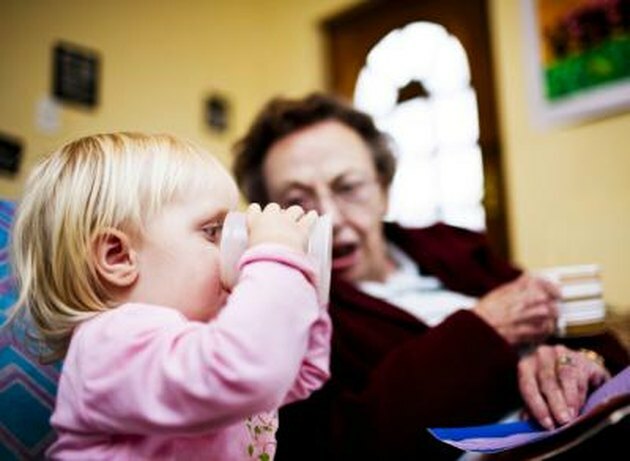 Slowly switch certain feeding or drinking times to a sippy cup. For example, during the day, use only a sippy cup or allow only a bottle at home. 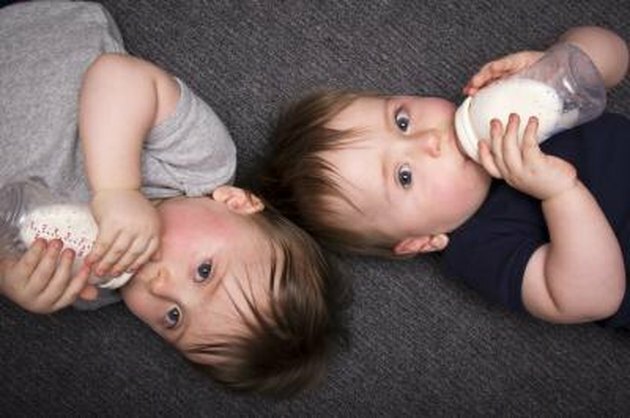 For most young children, the nighttime bottle is the most challenging to remove because it is comforting and part of the routine. Substitute it at bedtime with other sources of comfort, such as rocking. Regular cow's milk typically is used in place of formula once your baby turns 1. Whole milk is the standard because your 1-year-old needs the fat from the milk. Milk supplies necessary calcium to your young child. If your child doesn't seem interested in cow's milk, offer her a combination of formula and milk to make it taste more familiar. Eventually you can use more cow's milk until you don't need any formula in the mix. Instead of letting your 1-year-old constantly have a cup of milk, limit it to specific times with no more than 24 ounces throughout the day. Too much milk will fill up your child, causing her to eat less solid food that contains essential nutrients such as iron. Move your 1-year-old child away from the jarred baby food to eating real, fresh foods. Most foods you eat yourself are acceptable for young children. Cut up or shred meat into small pieces that your baby can chew. Cook vegetables and pasta long enough to make them very soft so they are easily mashed in the mouth. For 1-year-old children just learning to eat solid foods, mashing with a fork helps. Include a mix of grains, fruits, vegetables, milk products and proteins in your young child's diet. 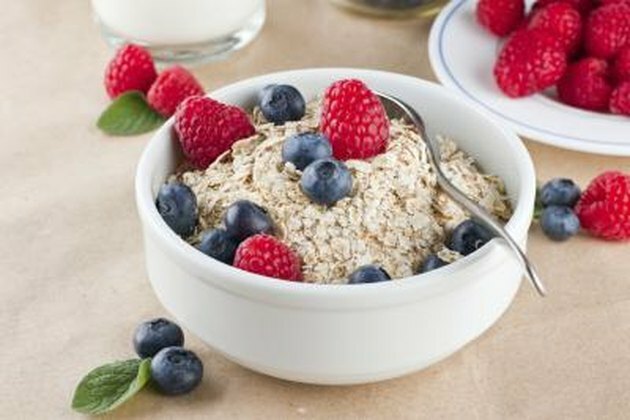 Examples include hot cereals such as oatmeal, toast, rice, cooked vegetables, yogurt, cheese, eggs and beans. For 1-year-olds, choking is a major concern. All food should have a soft texture so your child can eat it easily without all of his teeth. Cut all of his food into small pieces before serving. 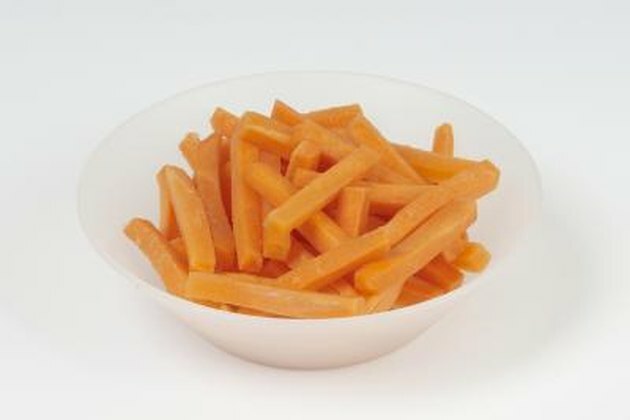 Cut round foods such as hot dogs and carrots in half lengthwise so the pieces aren't round. Never give a 1-year-old child foods such as nuts or popcorn that increase the chances of choking. Your child's appetite likely will vary from day to day, but continue offering a variety of foods each day.